Algeria‘s military has historically played a significant role in choosing the country’s civilian leaders. In 1992, President Chadli Bendjedid was shown the door to make way for President Liamine Zeroual. Then in 1999, Zeroual was forced to quit and Abdelaziz Bouteflika was elected president. On April 2, after six weeks of largely peaceful mass protests, Bouteflika submitted his resignation after Army Chief of Staff Ahmed Gaid Salah called for his immediate departure on account of his failing health. But Algerians today are more preoccupied about the government that Bouteflika left behind than they are about the military. Under articles 102 and 104 of the Algerian constitution, which regulate the process of removing an ailing or deceased head of state, a new government cannot be appointed until a presidential election is held. In an attempt to appease protesters, Bouteflika, just days before he stepped down, announced the formation of a new caretaker government that saw the appointment of 21 new ministers out of a total of 27. The reshuffle however, which included keeping newly appointed Prime Minister Noureddine Bedoui in place, failed to placate demonstrators. Many of those Algerians who have taken to the streets for more than a month to demand an end to the ruling order say they do not want Bouteflika’s close associates to remain in power. Bedoui is close to the former president’s powerful brother, Said Bouteflika, who approached Zeroual and offered him the opportunity to lead the transitional government, in a last-ditch attempt to secure a transition for the ruling elite. Zeroual told the daily Khabar newspaper that he met retired intelligence chief Mohamed Mediene on March 30, with Said’s blessing, but turned down their offer. How will Bouteflika’s 20-year rule be remembered? Senate Chief Abdelkader Bensalah – a longtime Bouteflika ally – is now acting president. Many, including members of Algeria’s opposition, as well as the hundreds of thousands of protesters who took part in the popular movement against Bouteflika’s rule, are questioning whether this move will guarantee a peaceful democratic transition and fair elections. By insisting that the constitutional process be respected, analysts say that Gaid Salah was likely hoping Algerians will accept highly unpopular figures to lead the country during the transition period. “[Gaid Salah] must now convince the people in the coming days that having the trio, made up of Abdelkader Bensalah as the head of state, Noureddine Bedoui as the head of government and Tayeb Belaiz as head of the constitutional council, was the ultimate goal of the millions of protesters during these past six weeks,” wrote journalist El Kadi Ihsane. 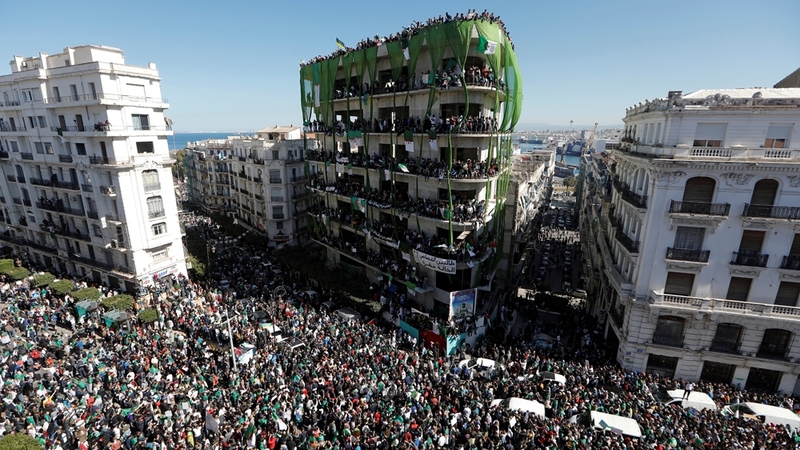 Although the military stepped in to force Bouteflika out, it is unclear how much Algeria’s most powerful and best organised institution is willing to concede to the protesters. Gaid Salah was himself a close confidant of the president and has only recently switched sides, defending the army’s intervention as indispensable for the country’s “unity and territorial integrity”. Abed Charef, a political analyst, said that strictly abiding by the constitution might allow the cluster of ruling party officials, bureaucrats and tycoons that profited from preferential access to lucrative state contracts, to organise and work out a succession plan. “A presidential election organised at the end of the [transition] could allow the system to fix the question of power but constitutes a dangerous option for the country,” said Charef. If protests persist, the army may decide to violate the constitution and step in again to rid the government of Bouteflika loyalists. A serious, and perhaps long, dialogue needs to take place about the values, laws and spirit of the new republic, Charef said.